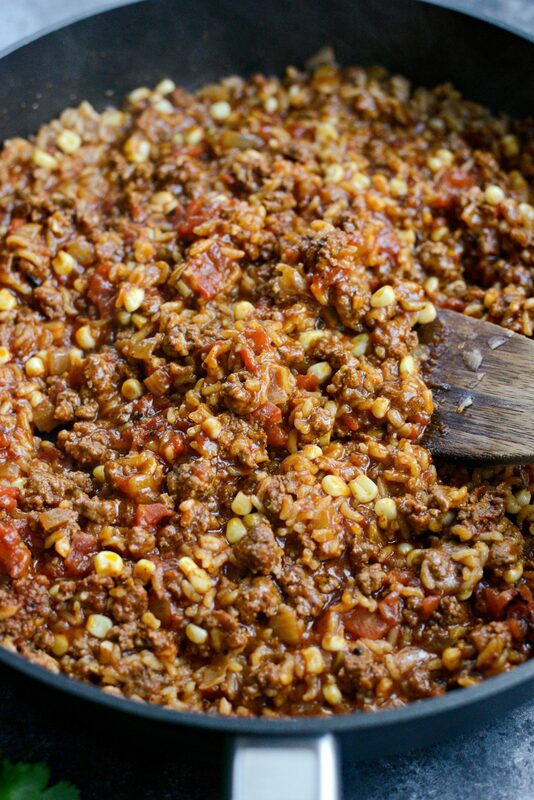 In this glorious one-pan Cheesy Mexican Beef and Rice Skillet, onions and garlic cook with seasoned ground beef, rice and corn in fire-roasted tomatoes and broth. 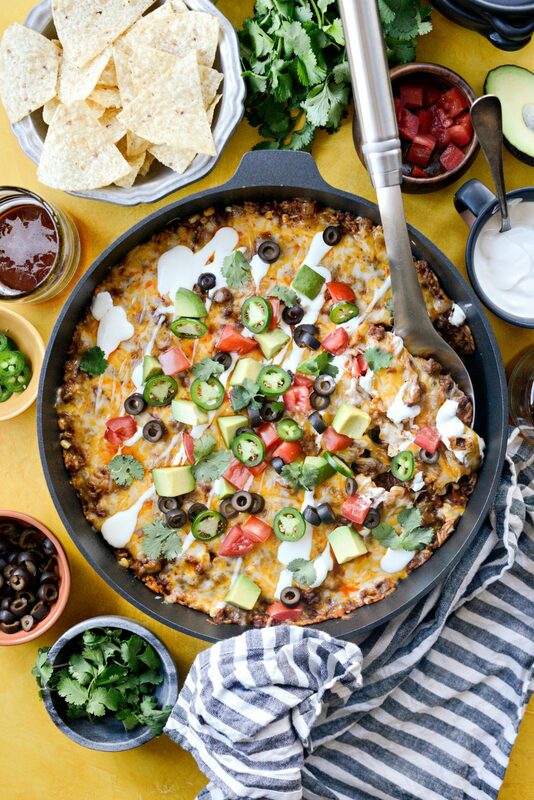 Topped with copious amounts of cheese and all the fixings and serve with tortilla chips. 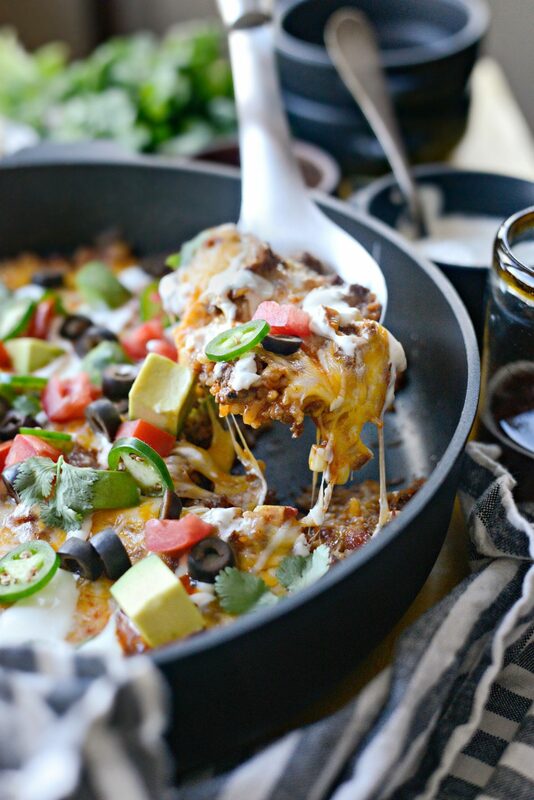 This skillet meal serve 6 in under an hour. Do you have a favorite recipe to make? 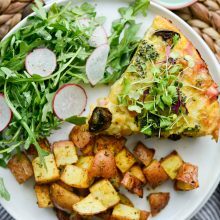 A breakfast, lunch or dinner recipe that you can just breeze through and enjoy preparing? 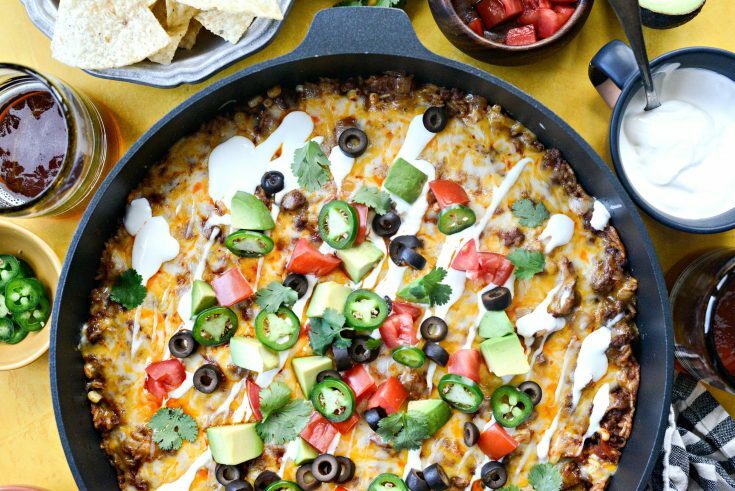 This Cheesy Mexican Beef and Rice Skillet is that recipe for me. 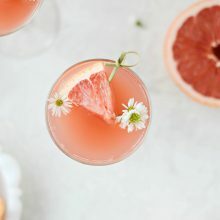 I love making this and I try to always have the ingredients on hand because it has saved my behind on more than one occasion. It’s a go-to, family favorite and if I’m ever struggling with what to make for dinner… I make this skillet dinner. A few weeks ago a reader (hi Laney!) reached out to me requesting some one-skillet dinners. I sent her a few links of recipes from SS, but little did she know, I started working on a few recipes right away. 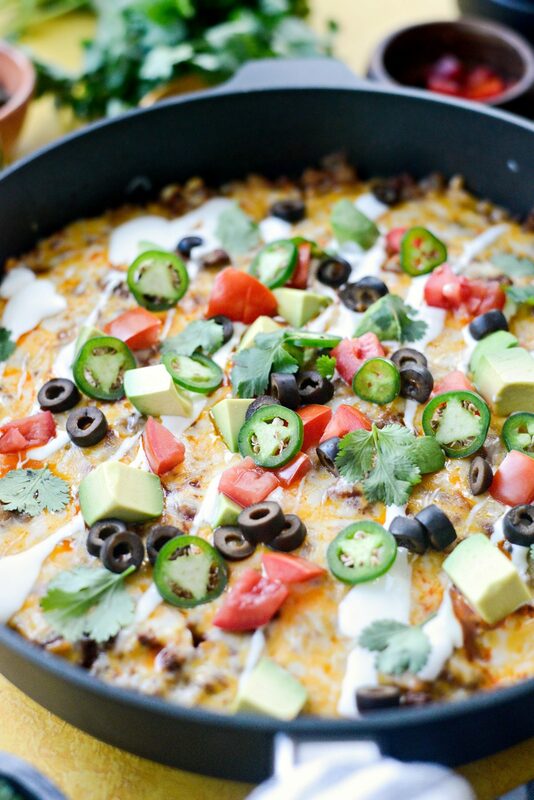 This Mexican rice skillet is the first one I’m sharing and I’m so excited about it too! I’ve made for dinner a ton- just ask my family- and no one is sick of it yet. Not only is it delicious but it’s so easy to throw together. I mean just look at it. YUM. 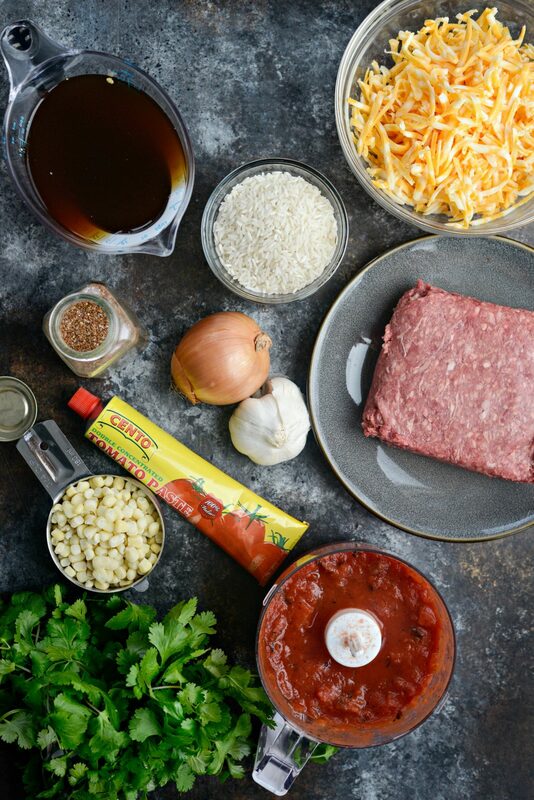 To make this one-skillet meal, you will need: onion, garlic, ground beef, tomato paste, taco seasoning, rice, corn, diced tomatoes, beef broth and cheese. 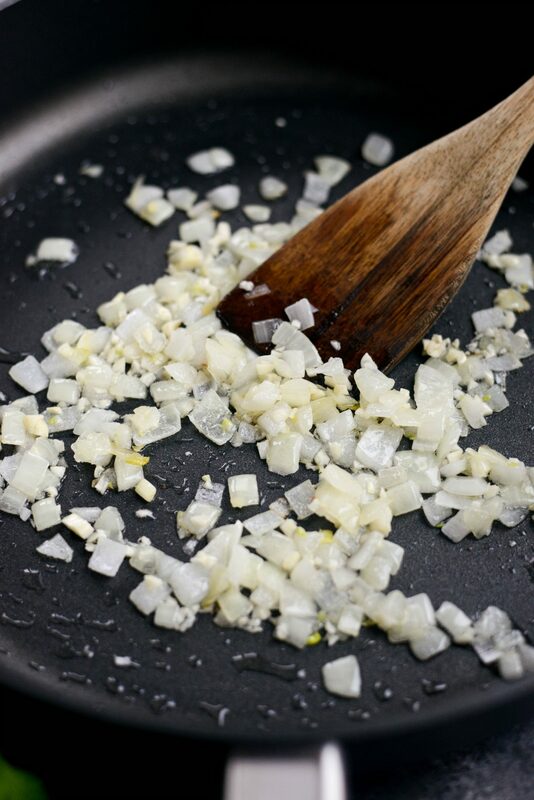 In a 12-inch, deep-sided skillet, sauté 1 small diced onion in 2 teaspoons olive oil over medium-low heat until tender, about 5 to 8 minutes. Next add in 2 minced cloves of garlic and cook for 1 minute. 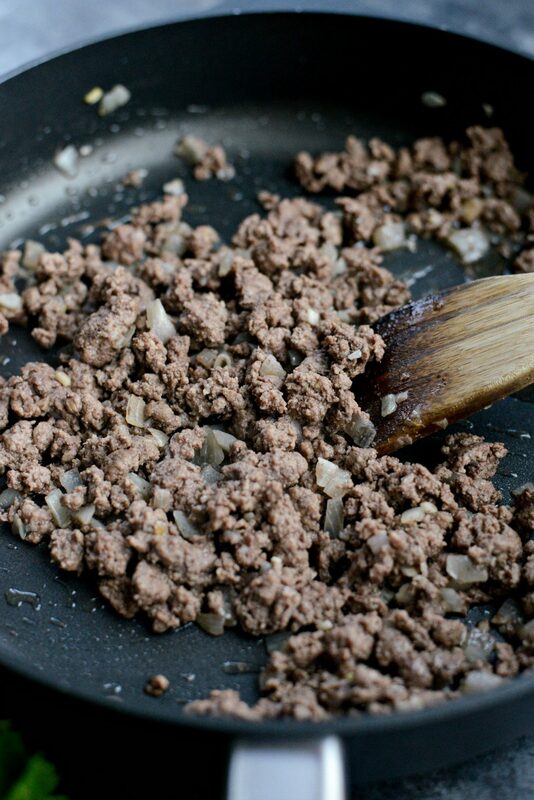 Then add in a pound of lean ground beef and cook until no longer pink, about 10 minutes, then drain off any excess fat. 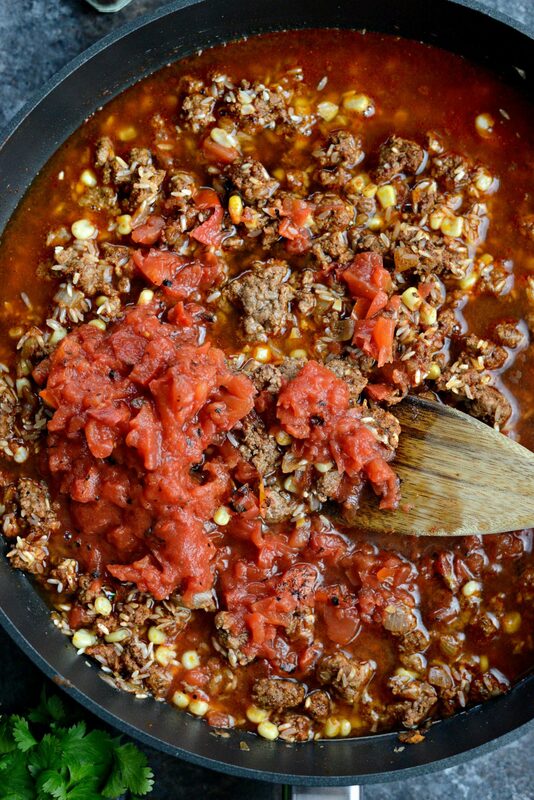 Next add in 2 tablespoons tomato paste and 3 tablespoons homemade taco seasonings, stir to combine and cook for 1 minute. Next stir in 3/4 cup of both the long grain white rice and sweet corn. Stir in 1 (15 ounce) can of both diced tomatoes and beef broth. 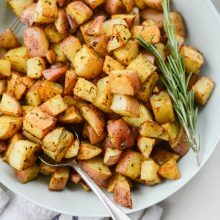 For the tomatoesI like using fire-roasted and I also pulse them in a mini food process for a smaller dice because that’s the only way my family will eat this. Large pieces of cooked tomato are a no-go. Stir everything together before covering, bringing it to a boil. Then reduce the heat to medium-low and simmer for 25 minutes or until the rice is cooked and tender. 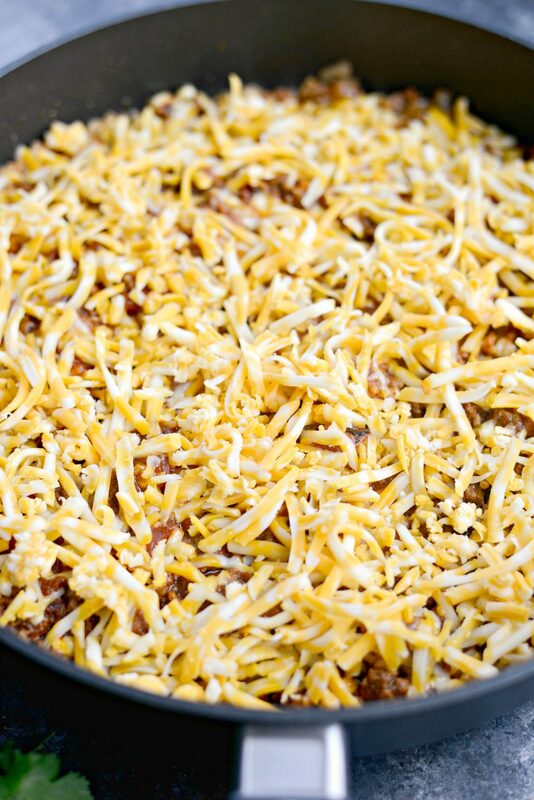 Once the rice is cooked, stir and spread into an even layer and sprinkle with 2 cups freshly grated cheddar jack cheese. Cover and cook on low heat until the cheese has melted. Alternatively, if your non-stick pan is safe to do so, you can slide the cheesy Mexican beef and rice skillet under the broiler as well. 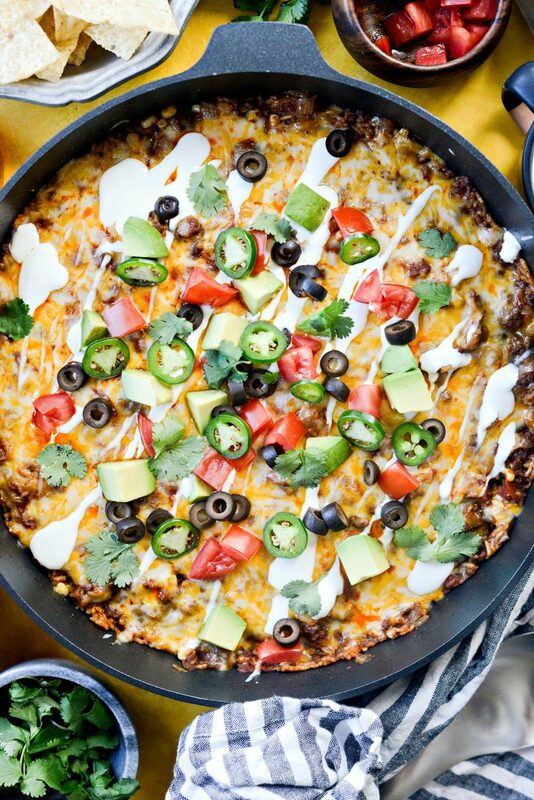 Finally, serve this skillet meal with sour cream, diced tomatoes, avocado, cilantro and sliced olives if that’s your thing. 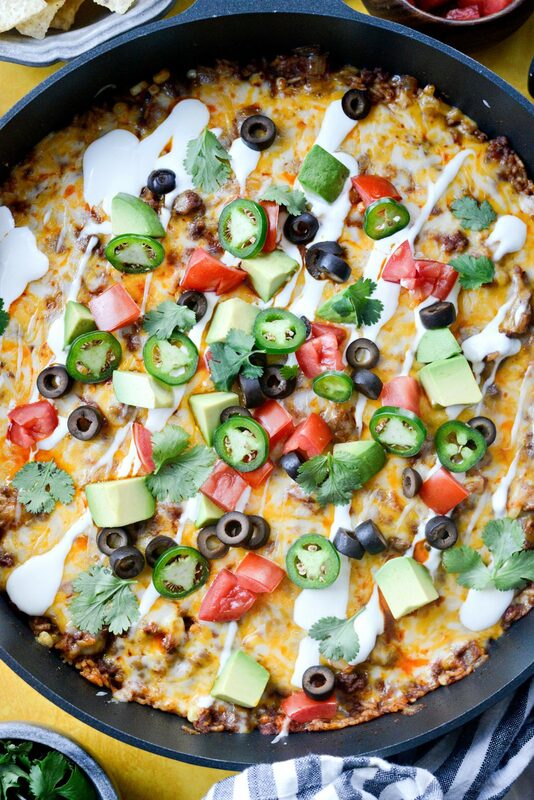 Although olives aren’t technically a Mexican topping it’s most definitely my thing and I love adding them to nachos, tacos and this cheesy Mexican beef and rice skillet. And because, why not? 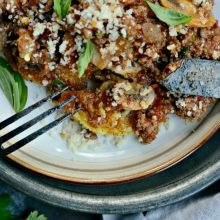 Try my other one-skillet meals! Enjoy! 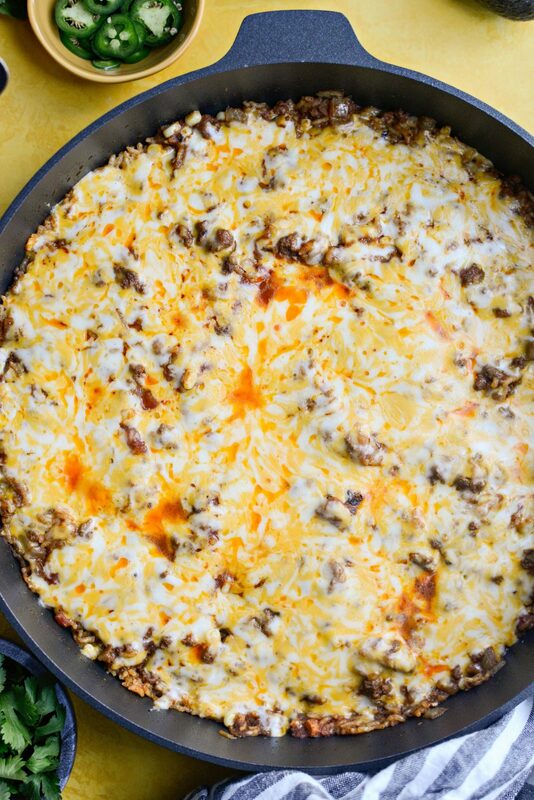 And if you give this Cheesy Mexican Beef and Rice Skillet recipe a try, let me know! Snap a photo and tag me on twitter or instagram! 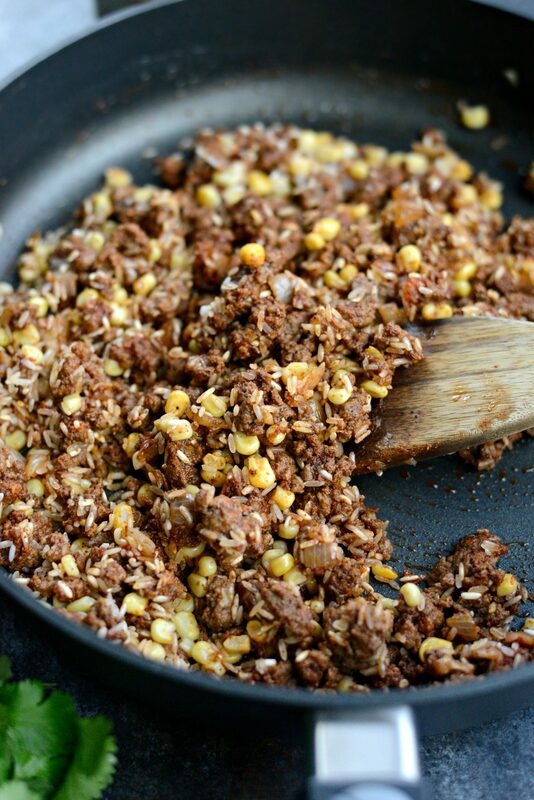 In this glorious one-pan Cheesy Mexican Beef and Rice Skillet, onions and garlic cook with seasoned ground beef, rice, tomatoes and corn in a simple sauce. 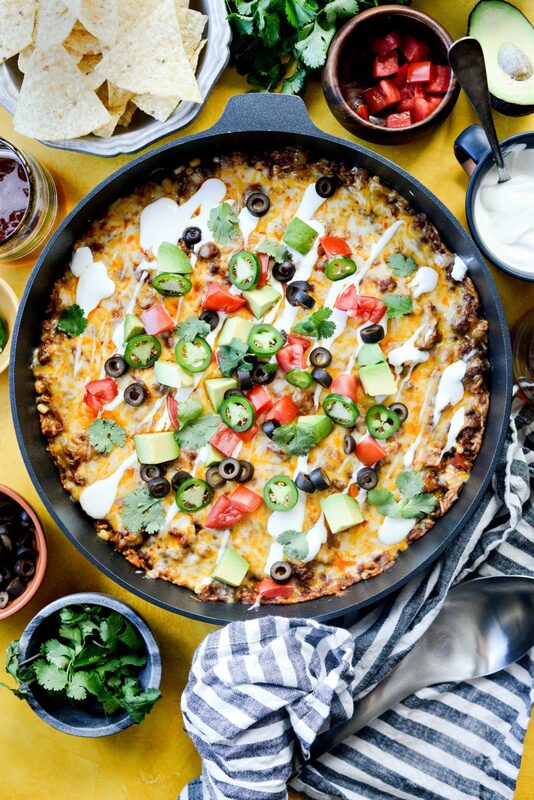 Topped with copious amounts of cheese and all the fixings and serve with tortilla chips. 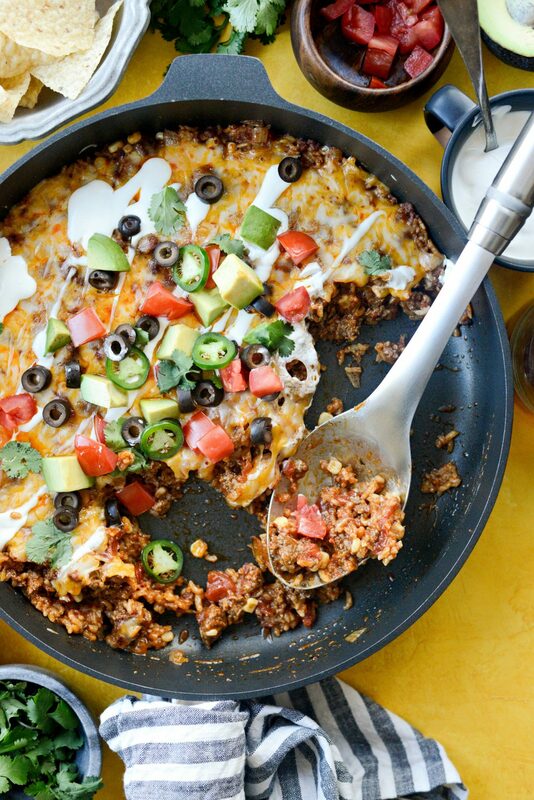 This skillet meal serve 6 in under an hour. 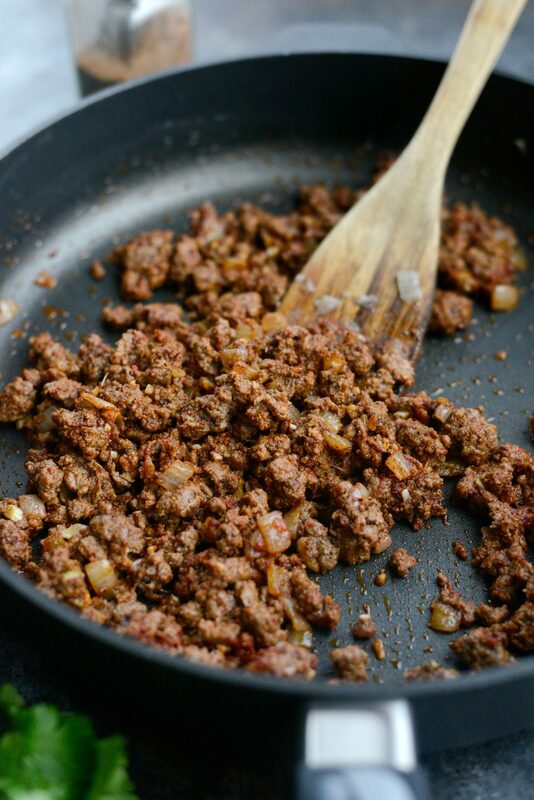 In a 12-inch, deep sided, non-stick skillet, sauté 1 small diced onion in 2 teaspoons olive oil over medium-low heat until tender, about 5 minutes. Next add in 2 minced cloves of garlic and cook for 1 minute. 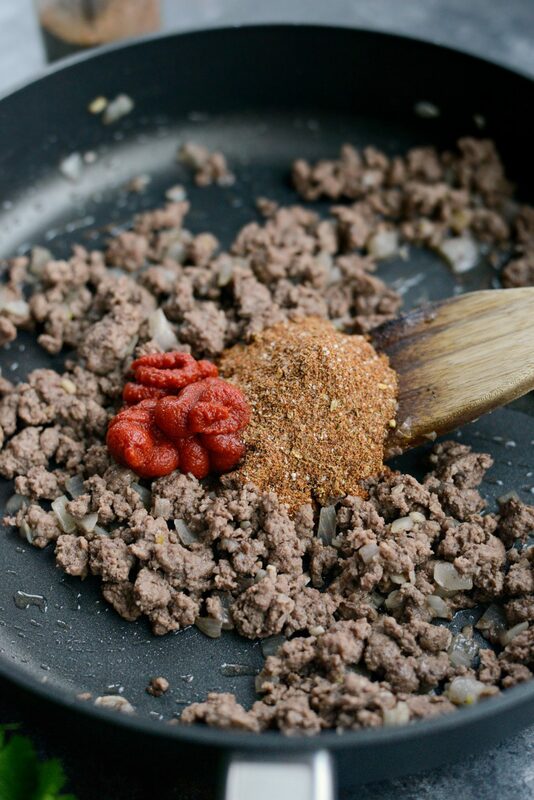 Increase the heat to medium and add in a pound of lean ground beef and cook until no longer pink, about 10 minutes. Drain off any excess fat and discard. Next stir in 3/4 cup both long grain white rice and sweet corn. Then add in diced tomatoes, beef broth and water. 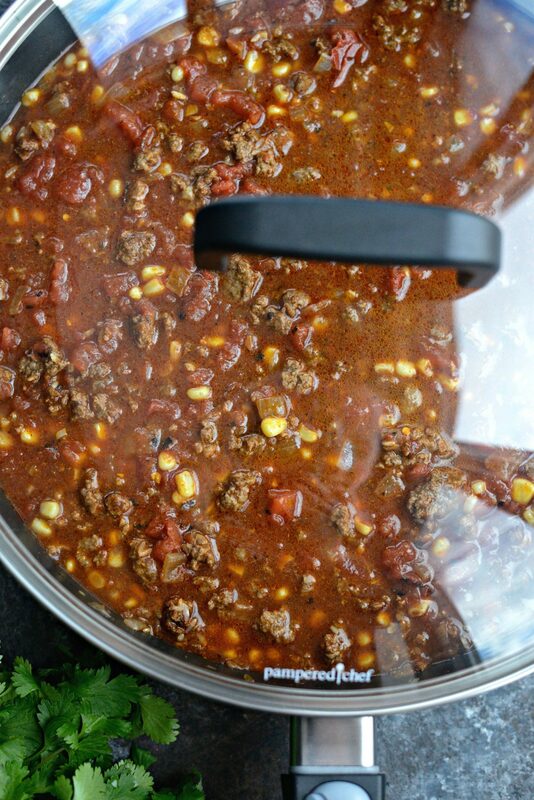 Stir everything together and increase the heat to medium-high before covering the pan and bringing it to a boil. 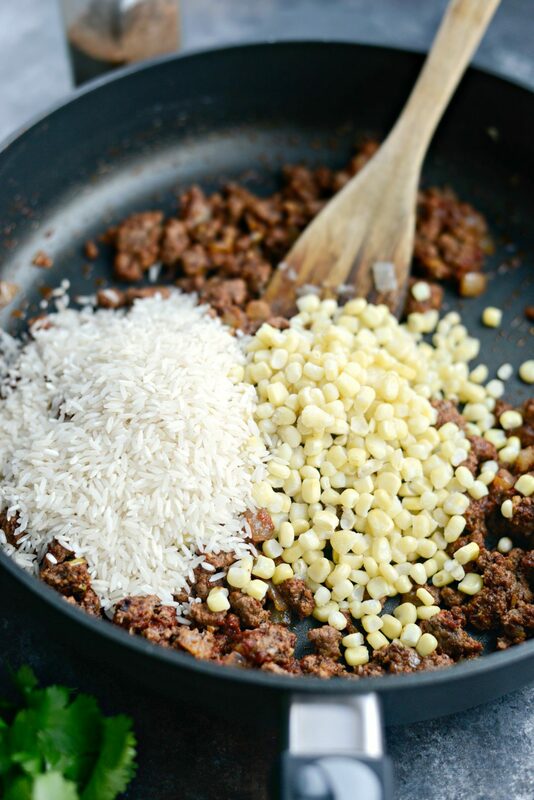 Then reduce the heat to medium-low (keep covered) and simmer for 25 minutes or until the rice is cooked and tender. Reduce the heat under the pan to low. Stir one last time before sprinkling with cheese and covering with the lid, allowing the steam to melt the cheese. Alternatively, if your non-stick pan is safe to do so, you can slide the skillet under the broiler as well. This looks so delish! I’m going to attempt this with brown rice. Thanks for the dinner idea! 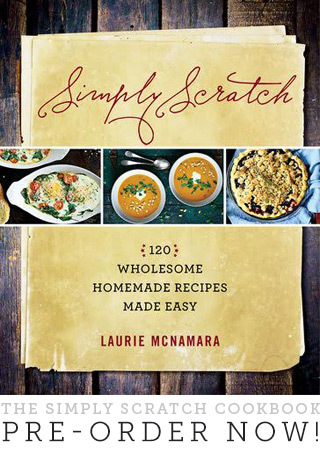 I love your book and all your recipes. They never disappoint. Hi Rachael! 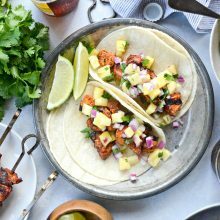 I’m excited for you to try this recipe! However brown rice takes a bit longer to cook and may need more liquids than the recipe calls for. 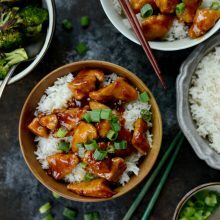 I haven’t tested this recipe with brown rice yet, so it’s hard for me to say for sure how to adapt it to yield the best results. However if you still decide to give it a go using brown rice, I’d love to hear how it goes for you and any changes you made. I’m with you, Julie! The less dishes I have to wash the better! Enjoy!